Figure 3.7. 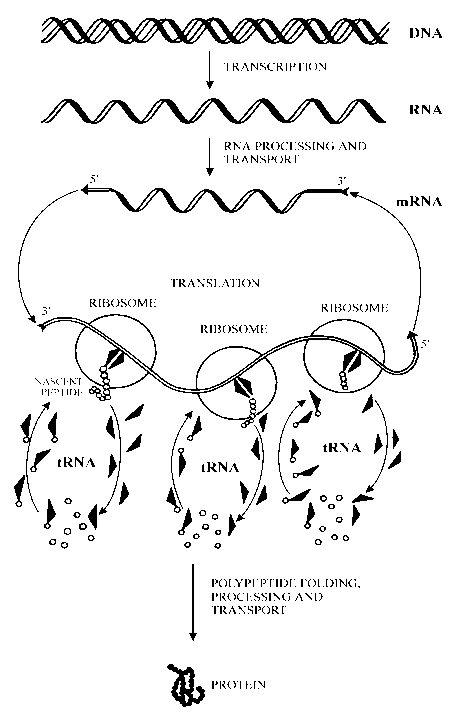 Scheme illustrating the folding of the tRNA helical regions into the tertiary structure (yeast tRNAPhe). (After S.-H. Kim, G. J. Quigley, F. L. Suddath, A. McPherson, D. Sneden, J. J. Kim, J. Weinzierl, & A. Rich, Science 179, 285-288, 1973; 185, 435-440, 1974). 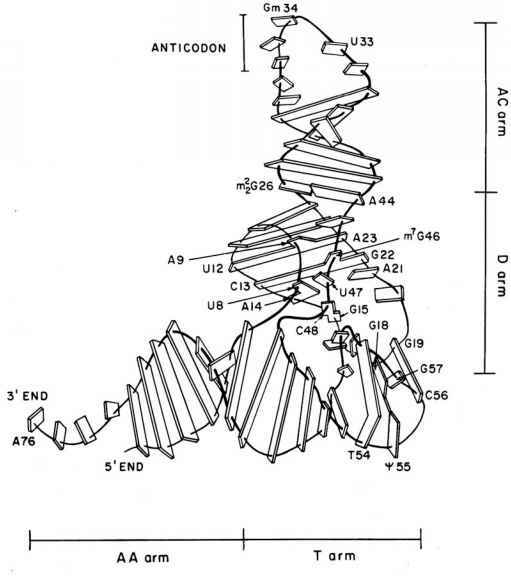 yeast tRNAPhe, the core can be seen as a concentration and intertwining of the chain sections in the region of the corner, especially at its inner side (Fig. 3.8). Each limb of the L-shaped tRNA molecule is about 70 Á long, and the molecule has a "thickness" of around 20 Á. The distance between the anticodon and the acceptor end is 76 to 78 Á All three bases of the anticodon on the top of one of the limbs are turned toward the inner side of the corner in the L-shaped molecule. Figure 3.8. Schematic drawing of the three-dimensional structure of yeast tRNAPhe. (Redrawn, with minor modifications, from S.-H. Kim, Nature 256, 679-681, 1975, with permission; see also A. Rich & S.-H. Kim, Scientific American 238, 52062, 1978). Figure 3.9. Base triple interactions typical of the tRNA tertiary structure: ball-and-stick drawings. Top, C13:G22:m7G46. Bottom, U12:A23:A9. Atom and bond designations as in Fig. 3.5.
the ribose residues of G18 and G19, whereas through its N7 it forms a hydrogen bond with the ribose of Y55. Even more complex tertiary interactions are observed in the core. As has already been mentioned, different sections of the polynucleotide chain are inter-wound here. A characteristic feature is the non-canonical purine-purine G:A or A:G pairing (depending on the RNA species) between residues 26 and 44. G:C pairing, or A:U pairing in other tRNA species, between residues 15 and 48, is unusual for double helices: in this case the orientation of chains is parallel. Even more unusual is A:U pairing between residues 14 and 8 where N7 of the purine ring participates in the formation of the hydrogen bond. Triple hydrogen bond interactions, such as U:A:A, or the equivalent G:C:G or U:A:G in other tRNAs, between residues 12, 23, and 9, respectively, are characteristic of this part of the molecule (Fig. 3.9 bottom). The triple hydrogen bond interaction is found also for C:G:G, or the equivalent U:A:A in other tRNAs, between residues 13, 22, and 46, respectively (Fig. 3.9 top). Computer images of the atomic space-filling model and the skeletal model of full yeast tRNAPhe molecule (viewed from the side of its TY loop) are given in Fig. 3.10 (compare with the schematic representation in Fig. 3.8). Figure 3.10. Space-filling (left, A) and skeletal (right, B) models of yeast phenylalanine tRNA. (E. Westhof, P. Dumas & D. Moras, Protein Data Bank of Brookhaven National Laboratory, PDB ID code 4TRA, 1989).